BRAGA, Portugal (AP) Portugal was held to a 2-2 draw by Tunisia on Monday in the teams’ first warm-up match for the World Cup. Portugal was without Cristiano Ronaldo, who still hasn’t reported to the squad because he played in the Champions League final with Real Madrid on Saturday. Andre Silva opened the scoring with a header in the 23rd minute and Joao Mario added to the lead with a powerful shot from outside the area in the 34th. But Tunisia rallied with a goal by Anice Badri before halftime and another by Fakhreddine Ben Youssef midway through the second half. 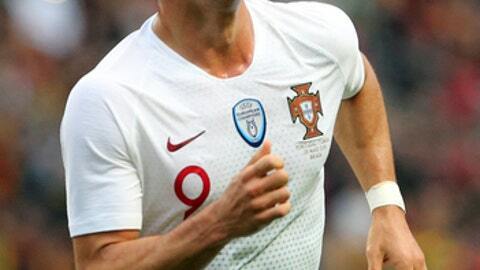 In addition to Ronaldo, Portugal also was without three Sporting Lisbon players who played in the Portuguese Cup final – Rui Patricio, Bruno Fernandes and Gelson Martins. Portugal heads to the World Cup trying to add to its European title from two years ago in France. Coach Fernando Santos is taking 13 players to Russia who helped the team win its first major title at Euro 2016. Portugal has two other warm-up matches scheduled: against Belgium on Saturday and Algeria on June 7. Santos’ men will start their World Cup campaign against Spain on June 15 in Sochi. Their other Group B matches will be against Morocco and Iran. Tunisia is in Group G and will debut against England on June 18. It then plays against Belgium and Panama. Tunisia’s other warm-up matches will be against Turkey and Spain.